Considering Weezer’s cover isn’t all that different from the original, the boys from Tears From Fears didn’t need to do much to recapture the more subdued nature of their original. 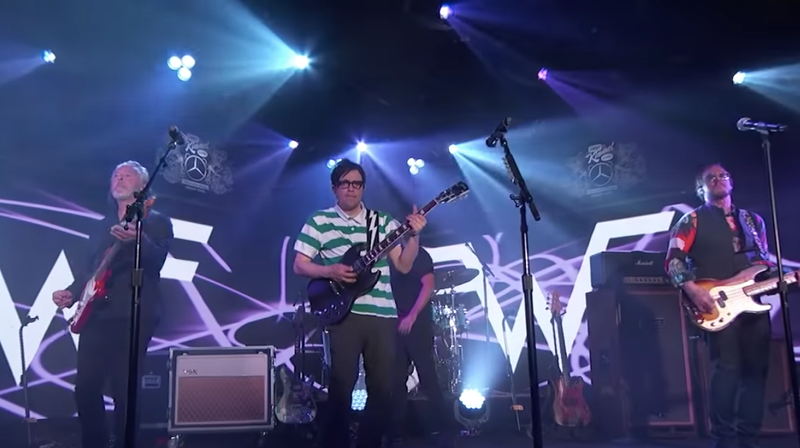 The performance comes fresh off of Weezer’s Coachella set on Saturday, where they performed a few of their own classics in addition to some of the Teal Album’s covers. When intro’ing “No Scrubs,” Cuomo remarked that “there’s a lot more girls than we’re used to seeing at a Weezer show” before bringing TLC’s Chile out to join them. Check out video from that performance below. In the liner notes for the Teal Album, Cuomo discussed the reason behind their song choices, including “Everybody Wants To Rule The World.” “This and ‘Sweet Dreams’ are from the same lineage as Weezer, it’s not that much of a stretch,” Cuomo wrote. “It’s such a great guitar song, too... The riffs are so neat,” guitarist Brian Bell added. It’s certainly a great song, and great for guitarists, which kind of makes you wish Weezer had added something to the original. But, hey, there’s no harm in giving Tears for Fears some much-deserved spotlight. Keep doin’ you, Weezer.